September | 2010 | Hey Ma! Look What I Found! I never – ever repeat myself. But today, I feel I must. Some specific topic is prodding at my sides. Yes, you guessed right. FACEBOOK. So again, what’s my point? Let me explain. It seems everybody I know is becoming a face-book slave. For example, a few days ago in business, the girl beside me quickly dashed to facebook while the teacher was out of the room. Damn! She said – they blocked it. Now I can update my status! Like jeez, what’s she gonna put there … In business class now?? As if anyone’s going to be reading peoples statuses while their in class. Unless it’s some creeper who does it for a living. That’s why it’s blocked. So you can FOCUS on work. Or how about my friend. She has no computer. For which I feel bad about, but still. She comes over, and the second I leave my computer, she’s tapping away … talking to some guy who says he hates her … and getting into a mess with him. It no surprise she begged to stay on while I scarfed down my pizza and got ready to go to the gym .. but we had to politely turn her away for the night. 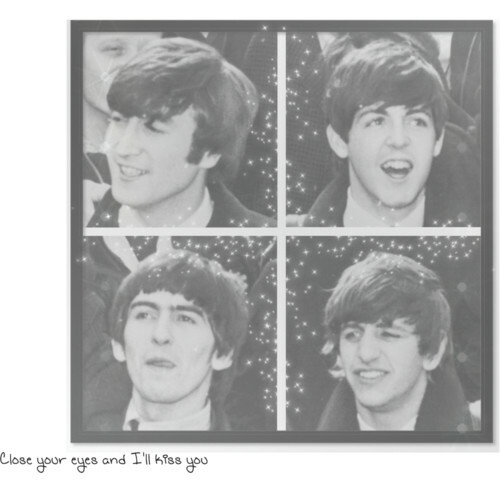 A Beatlemania set done on polyvore – made by me of course. Singing and typing – all at once. Ha. I realized that after reading about 50 different blog posts, that my room was dead quiet. So I put on the Beatles. God, I could be a third Beatle! It’s amazing, how good I sound. All that’s left is to buy a Les Paul. *wink wink* then I’ll be a skilled musician. Hey, I’m wearing a tie right now! Does that mean I’m in the band? Well, at least I can tell you the happy news that I yes I am a member of my school’s ROCK CHOIR! Wooo hoo! I’m actually part of something musical, instead of just dreaming of something musical. Getting signed to Capitol or Atlantic? Maybe I should make a mix for the a&r execs to drop off when I go to Cali? So okay. I’m really triply sorry. Honest. I guess I’m not the blogging type. Anyway, did I tell you I started grade nine? It’s been three weeks. I guess I’ve been hiding in a shell. So anyway, back to business. Of course, after I checked the charts, I just HAD to check the news also, hoping to find out about some scandal like so and so gets arrested for drug possession, or so and so has twins! Yes, out business teacher can view our screens and lock our computers, so I was ready to take the shock at any moment. The attention of a photo caught my eye. Yep, John Lennon’s photo. He often gets into the news, the last article I read on him was about a toilet of his selling for 750 + k.
THERE IS A F*CKING CONTEST! Yeah, it’s a cover contest, you either cover a Beatles song, or him solo. You win all this cool memorabilia, it’s insane. And then, those words that I dread: Post. It. On. Facebook. Grr! I don’t like Facebook. Who really needs it? So now I cant enter the contest because some genius couldn’t think of any better site to post the videos on. Well, I’ve bored you enough, haven’t I? Looks like I’m in trouble. I haven’t told you about my venture to Toronto to see South Pacific, my trip to the one and only Canada’s Wonderland, or anything else for that matter, for weeks. I must apologize. I’ve been so busy lately, what with computer issues, Itunes issues, which still need to be resolved and …..
Basically, you enter the school, stand in a line, and pick up your timetable. Then you get the opportunity to locate your classes and your locker, and also pay for things like a student card, and a yearbook. (They make you shell out at least 70$.) I suppose my mother can look on the bright side, because you get a free t-shirt after spending all that money …… wow. Then they give you “the talk” in the auditorium. Then you go & sign up for your clubs, and then there’s the BBQ. That’s it. Then you leave, and begin to dread Tuesday.